Life is full of ups and downs. Pits and spikes, too. Also birds and boulders. Well maybe not your life, but certainly the life of this plucky cyclist. Meet the titular Bike Rider, a nameless, featureless stick person whose boundless energy is at our disposal, and with it, we’re going around the World! The DX stands for... eh... actually it's a secret. As it turns out, cycling the World is easy… well, as easy as riding a mine-cart, Donkey Kong Country-style. Yes, much like DK, our hero is on a side-scrolling track, panning right at a constant pace. Gaps and obstacles lie ahead and to avoid them we can control our speed using the circle pad, and we can jab that ‘a’ button to jump, jump, jump! Yeah, there’ll be lots of that. Now, our Bike Rider is blessed with a double jump (eh, of course) and you’d be forgiven for thinking that this is a game-breaking safety net; not so. Soon enough into the game’s 50+ levels your double jump becomes as much a curse as a blessing, requiring some careful advance-judgement to reach your end goal in one piece. Also working to your advantage/disadvantage are the power-ups, speed boost, triple jump & glider, these help to mix up the challenge and never outstay their welcome. Each level lasts around a minute and it's finish line takes the form of a flagpole, no doubt a deliberate nod to the roots of platforming, which is exactly what’s on offer here, albeit in it’s simplest form. Eiffel Tower? Arc de Triomphe? Don't tell me... Las Vegas? Once booted up you are greeted with bright, bold menus and energized electro beats. 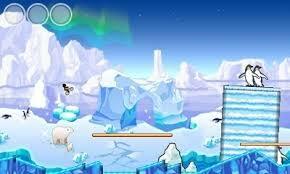 You can choose World Tour, the meat of the game, which takes you through Paris, New Delhi, Tokyo and beyond. Or Grand Prix, which serves up a randomly generated, endless runner mode with the objective of going the furthest distance without crashing. This mode boasts the best tune of the game not to mention a trippy, neon backdrop. The absence of an online leaderboard, however, means this isn't as essential as it should be, which is a shame. Another neglected function is Streetpass but let's not forget that this is one of the cheapest games on the eShop and it will give you well over an hour of simple, arcade fun per dollar spent. Speed Up! Or as I call it, Crash Faster! The 3D is implemented as it is with most side-scrollers, using 4 or 5 layers of parallax, and the effect is more useful than it probably should be. You see, the levels are very colourful (if a little generic) and the backgrounds are quite busy so without the 3D it can be tricky to tell what is obstacle and what is scenery. Slider up for this one. On the subject of scenery, each location has only 5 levels so if you are growing tired of the Beefeaters of London you won’t have long to wait until you are amidst the temples of Beijing. The music changes with each location too but while the tunes are sparky and pleasing they are readily recycled and not thematically linked to their surroundings. Thankfully, though, the soundtrack doesn't stop or reset when you crash out. You are promptly whisked back to the start of the level, hopefully a little wiser than you were before. In terms of longevity, you could blow through the World Tour in under 2 hours but then you’d be missing the point. The real challenge is to bag all 3 gold coins spread throughout each level. These are never hidden but will often require a courageous, snap decision to collect. The more you collect, the more bonus stages you unlock and they're worth it, some are intense white-knuckle rides sure to leave your thumbs in need of a good lie down. Penguins & polar bears on the same continent? Oh Bike Rider, what planet be this? One big positive I took from the game was that none of the levels need to be learned. By that I mean if you have your wits about you and attune your cat-like reflexes you can make it to the flag pole. It might be tough but no enemy appears without an audible warning and there are no sneakily designed traps to give you an unfair wipe-out (well maybe one involving a cannon). If you go down it's because you got sloppy, kid. On the flip-side, if you make it through first time with all 3 coins, well, pull on the white jersey with red polka dots because you're King of the Mountain! 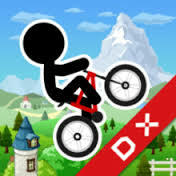 Bike Rider DX might be a fleeting diversion that borrows it’s ideas from here and there but the outcome is so polished and addictive (and at such a tidy price) that I think you’ll forgive it. I did. Great little review. Love your sense of humor! Sounds like a fun little game, so far as it goes. This was an enjoyable read! Good to hear the game wasn't complete shovelware, which is what I assumed it would be when I first saw it. Thanks guys. Yeah, it is a small game but this is my first ever review so, y'know, baby steps. It's good to get reviews of these no-name games. I'm tempted to give it a try. Nice review, man. I can honestly say that I never knew that this game existed. But the Game & Watch/Excitebike combo intrigues me. I'm going to watch the eShop video and consider a purchase. To watch the video is to know the game. Nice review! Game sounds fun... Dammit may need to buy! I love this quote, too. Very... zen. I think you and I are gonna be just fine, @kriswright. Juuuust fine. Hey! A sequel has been announced for Japan. I really think that a bit more inventiveness and a few more features could take this game to great heights. Fingers crossed. Thanks for raising my awareness for this game. Nice review. I enjoyed your first Negative World review, Super_Conzo! Good writing style. There's always a bunch of eShop games releasing periodically that are so easy to miss or disregard, and it's good to know that there are some fun gameplay elements to be had in some of them. The game sounds like simple fun for a low price. On the flip-side, if you make it through first time with all 3 coins, well, pull on the white jersey with red polka dots because you're King of the Mountain! I might've missed it in there (I don't believe I did), but with the constant pace, are you FORCED to move with the screen as well? Or, rather, do you make yourself move? I saw "speed up, crash faster," but I had nightmares (daymares?) of Paperboy while reading this thing. Thats good that there aren't any real cheap things in this game. DK Minecart stuff is intense! For me to answer that question would be to ADMIT that there is a hole in my review! On voting day? Hoo-hoo. Keep dreaming, buddy. .. so on a completely seperate issue I thought I should point out that the screen is moving at a constant pace and your rider will travel automatically but, within that, you have a little forward and backward control. You can slow down, but never stop. You can speed up, but never exceed the right hand side of the screen. 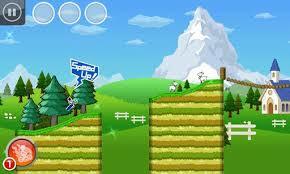 It also effects jump distance which gets essential later on when you're faced with a string of gaps of varying size. The game can get intense and frantic like the DK stuff but the levels are so short that it's not quite as heartbreaking to crash out. Also, infinite lives. Hey, I'm not trying to screw anyone over. As you can clearly see, I "bumped" / asked a question to each of the reviewers (except for my own, YESSSSSSSSSSSSSSSSSSSSSSSs.....no votes, forever and always). Playing through some of the NES Remix stages for Mario are SO hard when you can't stop. So, I guess it IS kinda like Paperboy in that regard? Ick. Infinite Lives are cool in certain games; this sounds like a good place for them. Thanks, bud. This game sounds interesting. I'd give it a try. How much is it? I liked the question you gave me at least. Gave me a chance to sort of add a bit of extra info to my thoughts on the game and the series. @Mr_Mustache Lol. Thanks man - I apprectiate the BUMP! I think I played Paperboy for 90 seconds back in the late 80's. That was plenty. @sirmastersephiroth I paid £1.79 for it so I'm sure it's around the $2 mark for you guys. If you think that you'd enjoy it then I guarantee you will. It's tight. @Super_Conzo I wish they would release Motocross Maniacs on the 3DS VC. This game kind of reminds me of it.